It was all so familiar-- the mountain, the cloud, the voice, Moses and Elijah. Peter, James, and John could not have missed these signposts. It all pointed to the fact that they were in the midst of something significantly spectacular. They were nurtured from childhood on the story of God's great deliverance of his people from Egypt-- the cloud by day that guided the people in the wilderness, the voice of God speaking of Israel, God's beloved Son, and the mountain where Moses received the Law from the finger of God. And Elijah, who later on would have his own divine encounter on Mount Sinai as a reminder that God was always moving and working despite the perceived circumstances. And perhaps Jesus' dazzling appearance before them reminded them of Moses, whose face shone so brightly from being in the presence of Yahweh that he had to veil his face so the people could look upon him. Peter, James, and John likely did not understand the full implications of what was happening in front of their eyes, but what did they know? 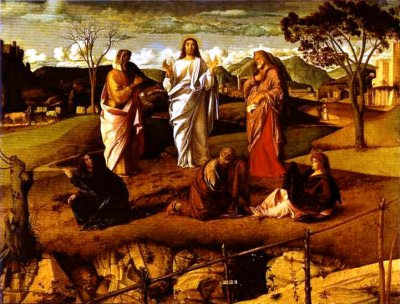 It's hard to say, but once Jesus' transfiguration takes place, there is no longer any way to think about the stories of their faith apart from the dazzling light of divine glory that they were witnessing in Jesus. While it was not fully understood, somehow and in some way the mountain, the cloud, the voice, and Moses and Elijah were pointing the way to this moment of Transfiguration, which was itself also pointing to something else, something larger and greater yet to come. Of the three synoptic Gospels, only Luke tells us that Jesus and Moses and Elijah are discussing Jesus' departure to Jerusalem. The word the NRSV translates as departure is the Greek term "exodus." If the disciples think that this dazzling light of divine glory could not get any brighter, they were in for a big surprise; for the divine glory revealed in Jesus would reach its zenith on a hill called Calvary and then in an empty tomb. In verse 36 Luke tells us, "and they (Peter, James, and John) kept silent and in those days told no one any of the things they had seen." For now they are silent, but it won't be too many days before Jesus' first followers will be unable to keep quiet. The dazzling light of divine glory will shine so brightly that their voices will proclaim the mighty works of God in Jesus Christ. The final exodus from sin and slavery will have been accomplished. Transfiguration and transformation go hand in hand.